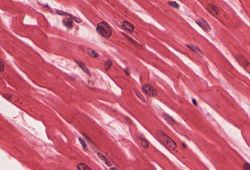 Cardiac muscle (heart muscle) is one of the three main types of muscle in vertebrates. It is involuntary: a person cannot control it consciously. Also, it is a striped muscle in the walls of the heart. It makes up the tissue called the myocardium. The other types of muscle are the skeletal and smooth muscle. The cells that make up cardiac muscle have one (74%) or two (24.5%) nuclei. The myocardium forms a thick middle layer between the outer epicardium layer and the inner endocardium layer. Coordinated contractions of cardiac muscle cells in the heart force blood out of the atria and ventricles to the blood vessels of the left/body/systemic and right/lungs/pulmonary circulatory systems. This mechanism illustrates systole (contraction) of the heart. Cardiac muscle cells, unlike most other tissues in the body, rely on the coronary arteries to deliver oxygen and nutrients and remove waste products directly. There is no time for them to diffuse. The heart muscle can become sick and weak. For example, if a person has very high blood pressure (hypertension), part of the heart muscle can get overworked. The heart muscle becomes bigger and cannot do its job as well. This is called hypertrophy. If a person has a problem with the system that controls the heart, the heart muscle may not beat the way it needs to. It may beat too slowly to get blood out to the body (this is called bradycardia). Or it may beat so fast that the heart does not have time to fill with blood and then squeeze the blood out to the body. This is called tachycardia (there are many kinds). The heart gets blood through the coronary arteries. These are special blood vessels that carry blood only to the heart. In order to do its job, the heart muscle needs a constant supply of blood and oxygen from the coronary arteries. If these coronary arteries get blocked, blood flow to the heart muscle can stop. Without blood flow, the heart muscle gets no oxygen. If this lasts long enough, the part of the heart muscle which is not getting enough oxygen dies. This is called a myocardial infarction, or a heart attack. ↑ Olivetti G; Cigola E & Maestri R. (July 1996). "Aging, cardiac hypertrophy and ischemic cardiomyopathy do not affect the proportion of mononucleated and multinucleated myocytes in the human heart". Journal of Molecular and Cellular Cardiology 28 (7): 1463–77. doi:10.1006/jmcc.1996.0137. PMID 8841934. http://www.sciencedirect.com/science/article/pii/S0022282896901376. ↑ Pollard, Thomas D. and Earnshaw, William. C. 2007. Cell biology. Philadelphia: Saunders. ↑ Left Ventricular Hypertrophy. Mayo Clinic. June 6, 2015. Retrieved November 26, 2015. ↑ Yingbo Yang & Jeffrey Rottman 2014. Sinus Node Dysfunction. Retrieved November 26, 2015. ↑ Coronary Artery Disease. Mayo Clinic. April 12, 2014. Retrieved November 26, 2015. This page was last changed on 17 September 2018, at 01:49.